There was a time, deep in the recesses of the 3rd century BC, when master artisans worked on tiny pieces of glass paste – some the size of a pin’s head – painstakingly hand-assembling them into patterns of bouquets, birds, frescoes and monuments. So tiny were the pieces that it would take 3,000–5,000 mosaics to create one square inch of design. Known as micro-mosaics, these intricate pieces of art were most often found in Venice, Florence and Rome by the late 19th century, where they were in great demand amongst wealthy tourists on Grand Tours of Italy. Then time passed – as time usually does – and the painstaking cutting and hand assembling skills of an ancient craft like micro-mosaic was replaced by machines and modernity. So much so, that by the beginning of the 20th century, these delicate artworks had faded away into history. That’s why my heart came to a screeching halt when I saw them glinting out of a boutique window in London’s Burlington Arcade just last month. The window belonged to Nourbel & Le Cavelier, a luxury jeweller that has started incorporating these historic micro-mosaic remnants dating from late 19th to mid 20th century into modern jewels, with a playful twist. Exploring further, I found that the brilliant necklaces, rings, brooches and earrings are designed by Nada Le Cavelier. Nada beautifully marries the inherent rarity of these century-old micro-mosaics with creative ways in which they have been re-set: the new jewel might take the form of a graceful butterfly, a delicate dragonfly, a friendly fish or Nada’s beautiful signature asymmetric earrings, but all the while it respects the shape of the original micro-mosaic. Each is handmade, one-of-a-kind and rich in both style and history. 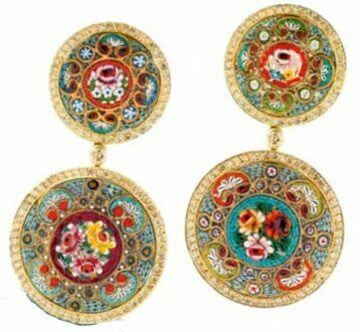 Many of the pieces in the Nourbel & Le Cavelier Nada Roma collection are also dressed up with 18 carat gold and precious stones, though in my mind there could be nothing more precious than these old and gorgeous bits of history themselves. 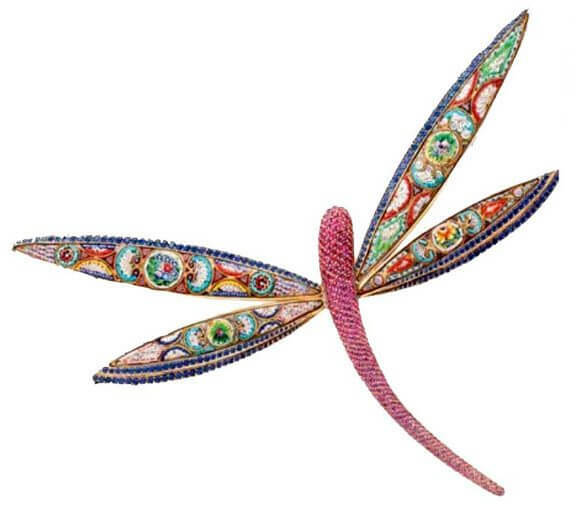 I have my eyes set on this gorgeous, gorgeous dragonfly brooch… if you like it, please drop a message for my dear hubby in the comments box, convincing himto buying it for me!!!! If he buys it for you then sell to me please then I will demand he buys it for you !